It's a sight that is a wonder to behold -- dark matter surrounding our planet. 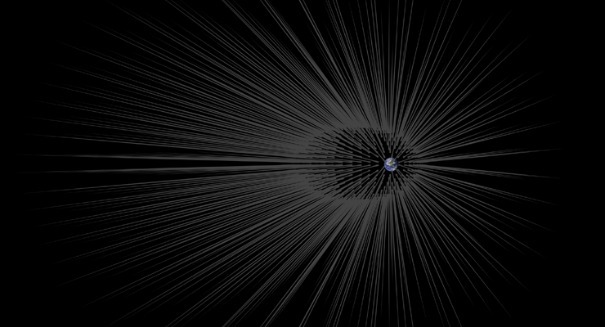 A groundbreaking new study out of NASA’s Jet Propulsion Laboratory in California has found what it as determined to be long filaments of dark matter — hairs, if you will — all over the solar system. The study, published by Gary Prezeau in the Astrophysical Journal, discusses the mysterious substance that we can’t observe directly but makes up a whopping 27 percent of all matter and energy in the universe, according to a Fox News report. Compare that with regular matter, the matter we can actually see, like stars and planets and galaxies, which makes up just 5 percent of our universe. That explains why scientists want to understand dark matter a lot more — not only is it cool, but it also makes up so much of our universe and we don’t even understand fully how it works. In fact, dark matter is so mysterious it’s never been directly observed, although experiments have been ongoing to change that. So where does the “hairs” claim come in? Research back in the 1990s indicated that dark matter took the form of streams of particles, with all particles moving at the same speed. So Prezeau used that information to create a computer simulation of what would happen when a dark matter particle stream headed for Earth. It showed that these streams form a really dense filament, which resembles that of a hair. He said the end result is lots of hairs sprouting from the Earth. And this dark matter actually would be affected by changes in density from within the Earth, sending ripple effects through these hairs. It’s a finding that could have important implications, helping scientists to better map out the layers of a newly discovered planetary body, or find evidence of oceans.